Of course, what he spied was 500 freemen exercising their medieval right to drive sheep across London Bridge for charity. There's a lot of it about. This morning's flock relay was in aid of Orbis and Wellbeing for Women. 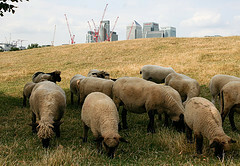 City living sheep not forced to relay across the Thames for charity stunts by Dean Nicholas. Roving report from Oli.